I have two very cool kids. They are kind, caring and goofy. But what I love most about them is that we have a shared love for cycling. My own passion for cycling started when I was 6 years old. My grandpa gave me a BMX bike for Christmas, navy blue with a race plate in front. It got stolen from my house a few years later, and that was the last time I ever left a bike unlocked. I remember always being on a bike as a kid. Then, when I went to university I got a road bike as it was a lot more convenient than taking 1 bus and walking a long way to get to my classes. 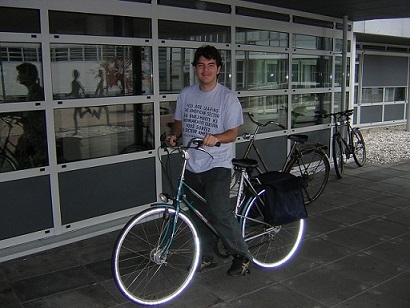 After university I moved to the Netherlands, and biking was simply a commodity. Protected cycleways everywhere, there were always hundreds of bikes everywhere I went, so I never paid much attention to it. It was simply part of my life. When I moved to New Zealand with my family in 2010, I realised that something was missing. I’d stopped riding. Just then I noticed that for the first time in my life I did not own a bike. So, I had to fix that. So, within 2 months here I got a new bike. The difference this time was that I would never ride alone again. Our son was nearly 2, so I started riding with him on the the back of the bike. A year later our daughter was born and when she was old enough we got her riding on a bike seat as well. The bike seats turned into a bike trailer, and the trailer turned into kids’ bikes. 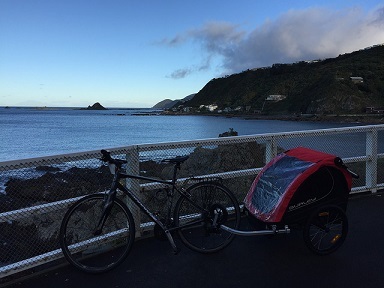 We are also very privileged to live in Island Bay, with Wellington’s first protected cycleway literally at our doorstep. 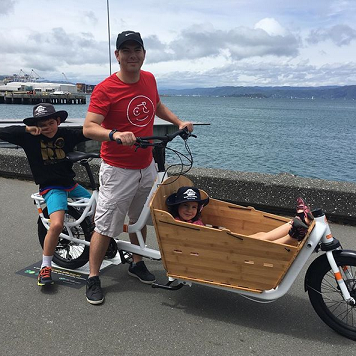 When the very first piece of the cycleway was available, my kids and I went riding on it. Note that allowing a safe space for a then 3 year old girl to ride her bike is the seal of approval that a cycleway needs. Fit for all ages and all abilities. Over the years we had many other great memories involving bikes: both kids cycling without training wheels, riding to school, going on the Wellington Ciclovia events, riding the South Coast Kids’ Bike Track non-stop, trying out cool cargo bikes on the Wellington waterfront, discovering mountain-biking together, the W.O.R.D. community, and so many more. The latest memory, ironically, happened while I was driving them to a school holiday program last week. Because if we are not riding our bikes, we are paying attention to other people on their bikes. On that day, I noticed this lady on her e-bike at the Island Bay cycleway, and she had googly eyes on the back of her helmet. The kids had a great laugh about it. Then I overtook her and we moved on with our lives. That is, until the next red light. – Me: Do you see now why I ride to work? It takes the same time as going by car! – Mr. 9: If there were cycleways to the city we could bike to the holiday program. – Ms. 6: And people would be jealous (laughs!). – Mr. 9: If we make people jealous, more people would ride their bikes! 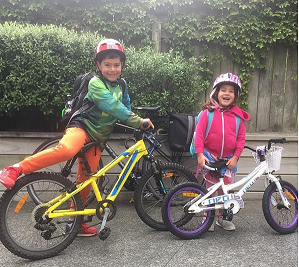 – Ms. 6: We should ask the mayor to build more cycleways so we can ride everywhere! – Mr. 9: Yeah, and then less people would drive too. – Ms. 6: And if we are riding on a cycleway and there are no cars, we will not need a helmet! I could not believe what I had just heard. Their dialogue caught me by surprise. I had never told them that mandatory helmet laws are a nuisance. I never explicitly told them about induced card demand. All we ever did was to have fun and be a role-model for them that it is possible to live a life that is not car-centric. They get it that you can’t solve traffic woes by adding more roads into a cramped city. They get it that cars are not the most efficient mode of transportation, and we should prioritise high-density transportation alternatives. They get it that helmet laws are a band-aid solution to utter lack of insfrastructure. They get it that our transportation network should be designed to move people and not cars. They get it that you can never feel as free and happy as when you are riding your bike.